Dubai is a city of towers. Ostentatious towers of glass and steel, 40 or 50 storeys high, lined up in rows along the main highways, and each complete with helipads and rooftop swimming pools. Elsewhere Dubai is a jungle of cranes. Some cluster at the airport, where a third terminal is going up exclusively for the use of the local carrier, Emirates. Or there is Sheikh Zayed Road: home to an enormous construction site dominated by a tower - the Burj Dubai - which, when complete, will be the tallest building in the world at more than 160 storeys. The people behind it are coy about saying exactly how tall for fear of competition, although they do promise the last word in luxury and prestige. But Dubai has another face. On the outskirts of the city, where the desert begins, are the concrete barracks where the workers live, thousand upon thousand of them. 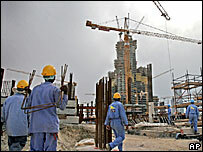 Dubai is being built virtually from scratch - 20 years ago few of these gleaming towers existed - and the men building it are migrants from India, Pakistan, Bangladesh and Nepal. They work for about $5 a day, sleep four or five to a room, and see their families once every two or three years because it's hard to raise the money to pay for a trip home. I met a group of workers - from Andhra Pradesh in southern India, from Kabul in Afghanistan, and from Pakistan's North West Frontier Province - one evening after they had returned from work. They were preparing dinner in a small, dingy, communal kitchen with a noisy fan. Scrawny cats ran across the compound; a cockerel scratched in the dirt. The balconies were festooned with the men's washing. "We get 600 dirhams a month ($160)," said one. "They deduct 200 dirhams for our food and it costs another 100 for us to phone home. It's impossible to save anything." "Many of the workers suffer great stress and depression," says KV Shamsudeen, an Indian businessman, who has set up a charitable trust on their behalf. He says many of the workers have to take out loans in order to pay an agent in their home country to find them a job, even though this type of commission is illegal. "The people who come here aren't able to take loans from the banks, because they don't have any assets," Mr Shamsudeen says. "So they borrow money from personal lenders. The interest for such loans can be as much as 10%." As a result, many workers find themselves heavily in debt, and KV Shamsudeen says there have been a number of suicides among expatriate Indians: 74 in 2004, 84 in 2005 and 25 so far this year. There's little that workers in the United Arab Emirates can do to improve their lot. Strikes are illegal, although there have been several recently. And because there is no right of association, there are no trade unions. So when, for example, pay is late, there is little the men can do about it. The lack of redress also means that smaller grievances - like having to wait an hour at the end of the day to clock off - can suddenly boil over into violence. However things look as though they might be about to change. The UAE government is sensitive to criticism. In 2004, for example, it ordered a magazine to withdraw from circulation an edition in which it had published information on the number of men killed on construction sites. Organisations like the World Bank and the IMF, as well as the United States have all made clear that they want the UAE to improve labour conditions. The government has now responded by saying that a new labour law being drawn up will allow workers to organise. Current plans, according to the minister of labour, envisage a single union with separate representatives for different industries. The minister has said he expects the proposed law to be in place by the end of the year.